Bed time for a little one can be overwhelming. I like to think that a daily routine works great for kids of all ages. With a one year old in the house, there are nights where she fights me to go to sleep and those nights are tough. Over the last couple of months I have to admit bedtime has been so much easier. We received a Sleep Sheep Essential Gift Set from Cloud B. I've reviewed a couple items from them before and I've never had a bad experience. In fact, our chameleon is still in little one's bed and gets turned on when she's getting ready for bed. 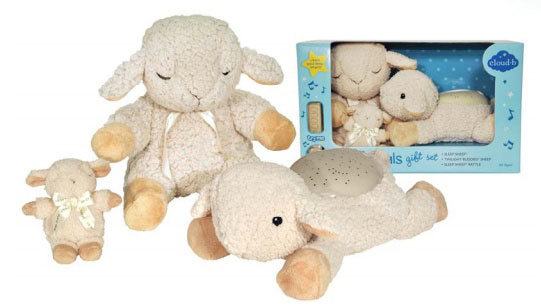 The Sleep Sheep Essential Gift Set includes Cloud B's Sleep Sheep, Twilight Buddies and their Baby Sheep Rattle. Sleep Sheep is a plush with a hidden sound machine that plays white noise to help calm and comfort little ones while they fall asleep. With the options of playing soft sounds of nature or the reassuring sound of a mother’s heartbeat, Sleep Sheep is a great companion for a relaxing, restful night. It also safely attaches to your baby’s crib with a velcro strap. Twilight Buddies Sheep is a cute, cuddly companion that helps eases fear of the dark by projecting a starry night sky onto bedroom ceilings and walls. It includes three real constellations within the star pattern. What I love about the Twilight Buddies Sheep is that it also has an automatic timer that shuts off after 45 minutes so that it's not on the entire night. The Baby Sheep Rattle is great for quiet play and is small enough that it's a great toy to take with you while you're on-the-go. It's designed for developing little fingers to grab onto and is perfect for them to play with while traveling. With our nightly routine of bath time after dinner and then a sippy cup of warm milk, at around 8:00pm my little girl is tired and ready for bed. She knows it's bed time when we put on both her Sleep Sheep for soothing noises and her Twilight Buddies Sheep so that her room isn't completely dark while she's on her way to sleep. Disclosure: All opinions are my own. I received Cloud B's Sleep Sheep Essential Gift Set at no cost for the purpose of this review. No other compensation was received.